SEO is not a one-time task. A good SEO strategy encompasses several steps initially, and ongoing monitoring, tracking and reporting to stay on top of the game. Because search engines are constantly changing their algorithms for what factors make a website appear in the top of search results, it’s naïve to believe you’ve reached success because you’ve climbed toward the top. Sure, the initial steps of the SEO process can be completed once, but the ongoing monitoring and tweaking needs to continue well beyond. 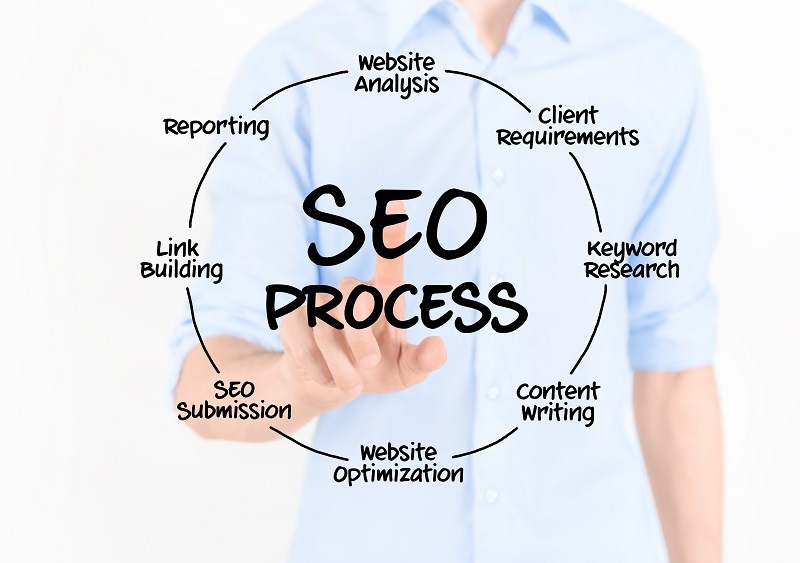 Let’s look at the basic steps of an effective SEO implementation process. If you have a website for your business, the first step is to run an SEO audit on it. The audit will check your website for keyword ranking, content, current SEO level, inbound/outbound links, social media presence and how you rank against your competition. Performing keyword research is not always a straightforward process. Some keywords, obviously relevant to your business and product, can be highly competitive, making it futile to use them for ranking. There are tools that you can use to analyze and research what keywords and phrases might work best, but sometimes it takes plain old logic to determine the best ones. For example, what will my target audience use in their search queries to find my product? And if they find your website using certain keywords, will they like what the results are; i.e., does your website answer their questions and fulfill their needs? Will the traffic those keywords bring result in a conversion to a sale or monetary gain? Reviewing the details and underpinnings of your website design can reveal some areas that need modifications to improve SEO. Looking at page titles, meta descriptions and internal/external links are some areas that need review. Developing a content-to-keyword map helps as well. Backlinks are links between websites; a backlink points back to another website. Backlinks are crucial to successful SEO, because they represent trust and confidence. Backlinks to your website are a signal to search engines that others vouch for your content. In this step of the SEO implementation process, your website’s backlink profile is analyzed and a plan created for building quality links. This is where content is reviewed on your website, social media channels, blogs and wherever your brand name is mentioned under your control. A blogging calendar should be set up, to include dates and topics to be published. The keyword analysis results will be used to develop calls to action and other marketing opportunities. Claiming your business listing in Google My Business can boost your SEO considerably, so it’s important to do so. There are dozens of directories and review sites where you should list and claim your business. Search engines love these, and it will definitely work in your favor as long as they are relevant to your business. You’ll also need to make sure your Name, Address and Phone (NAP) is consistent throughout your listings and with your website. Reports showing status of your SEO progress will help determine if the strategy is working well or if it needs some tweaks. Periodic keyword review and analysis should be conducted to ensure they are still working to your advantage. Even if you’re lucky enough to achieve the coveted first page of Google results, you can’t rest on your laurels and hope that it stays there. Competition is fierce and you need to stay on top of the game to keep up.